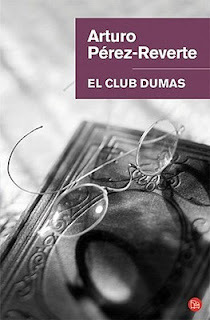 I've been in the mood to read something in Spanish and for that reason I've decided to pick up El Club Dumas de Arturo Pérez-Reverte. I had bought it a couple of months ago but since I had other books to read, was unable to read it sooner. Lucas Corso is a book detective, a middle-aged mercenary hired to hunt down rare editions for wealthy and unscrupulous clients. When a well-known bibliophile is found dead, leaving behind part of the original manuscript of Alexandre Dumas's The Three Musketeers, Corso is brought in to authenticate the fragment. He is soon drawn into a swirling plot involving devil worship, occult practices, and swashbuckling derring-do among a cast of characters bearing a suspicious resemblance to those of Dumas's masterpiece. Aided by a mysterious beauty named after a Conan Doyle heroine, Corso travels from Madrid to Toledo and to Paris on the killer's trail in this twisty intellectual romp through the book world. I know that The Ninth Gate by Polanski - staring Johnny Depp - was based on this novel but I haven't watched the movie yet; I might do it after finishing the book. So far I'm 120 pages in and I'm really enjoying it. I was a little afraid I wouldn't like the setting or the narrative style but so far I've been really loving all the mystery about books and Corso's line of work.